Aw the feel of sweet clover or alfalfa filled air rushing at your face the cool air from cattle ponds and creeks making the experience even more enjoyable. Oh but wait, are those thousands of needles pricking at my skin? Many of us drive cages, and some of us are on two wheels. 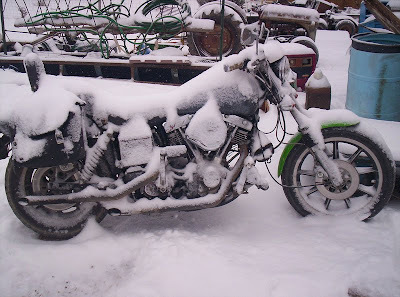 As a motorcycle "enthusiasts" there are a few things we can do to be prepared. Most know that leathers are wonderful to have in storms. Helmets help in the freezing cold, and you should have a small flare around somewhere. Simple, but what if your ol' lady starts smacking your back as you are doing 90, I mean the speed limit, trying to get you to pull over because she just heard that SHTF over her headphones? Or if you pull in a small town to get gas, and the entire village is there gossiping, and taking all the gas available? Time to get your riding boots firmly planted to the ground, and think what to do before it happens. Saddlebags, if you don't have any, I suggest getting even a small pack. Now motorcycles can go where other vehicles can't, you might want to include a tire patch kit just in case a little off roading is necessary. Remember to keep a cool head, and always know where you are, and where you should be going. And I know a great little shop that can help you with some of these needs, as well as an awesome mechanic that can prep your bike for the long haul. In fact the mechanic for Broadway Street Bikes, is a Prepper.